Jordan Rigdon, who is graduating with a B.S. in early childhood special education, is MGA's 2018 Academic Recognition Day Scholar. High School: Peach County High School, Class Of 2012, where she was an honor graduate, member of the varsity tennis team, Future Educator’s Club, Peach County 4-H Club, and was named Class Clown runner up. Family: "My ever-supportive parents are Jerry and Judy Rigdon. I have two sisters who simultaneously double as best friends. Their names are Jessica Kittle and Jennah Rigdon. My four-legged love’s name is Allie. I am, moreover, blessed to have the love and support of my longtime boyfriend, Cory Hortman. I’d like to thank his parents and sister, Greg, Joy, and Caleigh Hortman, for their unending support of my endeavors." Employment: "I am currently employed at Academy Sports and Outdoors. I have worked for Academy Sports and Outdoors for a total of five years. I have had the privilege of serving in several different leadership positions while there." Degree Objective: Bachelor of Science in Early Childhood Special Education. Class Rank: Senior. Primary Campus: Macon. Career Goals: "My career goal is to instill the love of learning and thirst for knowledge in to the students I have the luxury of teaching. My personal goal within my career field is to love all students as if they are my own and to make them believe they are capable of anything that they set their minds to. My short-term goal is to teach in the U.S. for at least three years. I plan to further my education with a master’s degree. My longterm goals include teaching internationally for the Department of Defense, acquire my doctorate, and become an assistant principal of instruction. She chose Middle Georgia State University because … "I wanted a school that was not only convenient but that would provide an education in which I was a marketable professional. The School of Education employs professors that sincerely care about the students. The school has provided hands on experiences and the knowledge necessary to ensure that all teacher candidates are of the utmost quality and are career-ready." The greatest thing she discovered about Middle Georgia State was … "The beauty of the Macon Campus. In my opinion, there is nothing greater than being surrounded by the magnificence of the outdoors when studying course material." 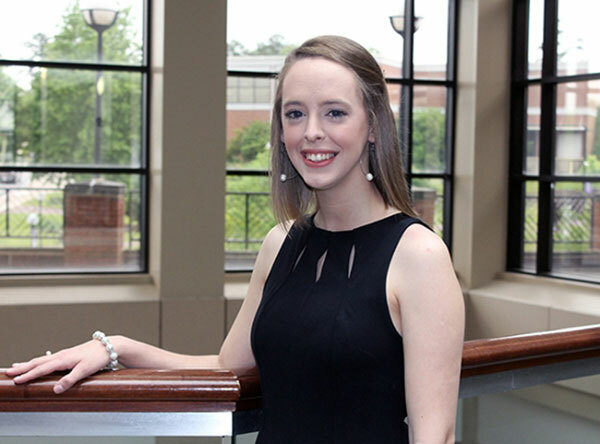 Her greatest academic experience as a Middle Georgia State student has been … "Being named MGA's 2018 Academic Recognition Day Scholar. It was an honor to be nominated by professors within the School of Education and to be chosen by the Academic Recognition Day committee to represent MGA. This experience granted me the opportunity to present myself on behalf of MGA at a Board of Regents Meeting in which I, along with other Academic Recognition Day Scholars from other University System of Georgia institutions, were recognized for our hard work and contributions to our respective institutions." To her, “greatness” means … "Continuing to better yourself. However, bettering yourself does not always stem from gaining academic knowledge. Bettering yourself entails capitalizing on any opportunity to contribute to your own quality of life. Bettering yourself involves strengthening your social, emotional, spiritual, environmental, occupational, intellectual, and/or physical wellness. Greatness encompasses the pursuit of continued growth." In five years … "Professionally, I see myself having acquired my master's degree and working on my doctorate while living internationally and teaching for the Department of Defense. Personally, I’d like to be going on adventures on a regular basis, embracing the beauty of the world outside the U.S. I'd like to be surrounded by more rescue dogs and by people who contribute to and support my pursuit of greatness."